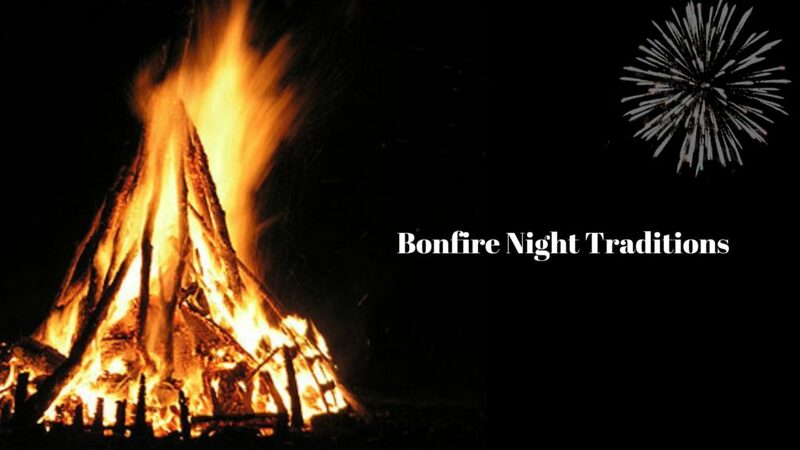 In England, Guy Fawkes Night is Commonly known as Bonfire Night, (or Firework Night). It is on November 5th in the UK every year. We celebrate this tradition in honour of the failed plot. The night skies fill with smoke from bonfires and colour and sound from fireworks. Bonfires used to cook jacket potatoes. A traditional cake eaten on the bonfire night celebration is Yorkshire Parkin. Other foods have also used on the night. . . Read more. Major towns and cities hold local events of bonfire and firework. They burn old pallets and effigy of Guy Fawkes. . . Read more. Fireworks are a reminder of the gunpowder stored in the cellar. It is popular today to buy fireworks from supermarkets or dedicated retailers. . . Read more. Robert Catesby has a secret plan to kill King James. Guy Fawkes returning from war joined the plot. The cellars of parliament hid the gunpowder. . . Read more. Penny for the guy was popular among children to buy fireworks. A guy made out of used newspapers and old clothing. This activity died out. . . Read more. The United Kingdom school children are introduced to the famous nursery rhyme at a young age. . . Read more. Fireworks we use at our events are thanks to the discovery of the black powder in the Tang Dynasty. . . Read more.